The Baby Brezza Formula Pro heats, measures and mixes baby bottles with the push of one button saving parents time, energy, and sleep! We recommend it- it’s life changing! However, there are trade-offs you need to consider including the cost and time it takes to clean it. The Baby Brezza Formula Pro tends to have varied reviews. A lot of people are totally in love with this easy to use product however there are also a decent number of people who absolutely hate it. One Button Bottle: The Baby Brezza Formula Pro warms and mixes a formula to create the perfect baby bottle with the push of one button. It’s like an instant coffee maker for your baby. There are a few things to set up but once you have it all configured you only have to put your bottle in and press start. The machine does literally everything else. This is a lifesaver for new parents during those dreaded middle of the night feedings. Due to the simplicity of the machine you don’t have to be fully awake to use it, you can cuddle your infant while it makes the bottle, and then you can simply relax while your child eats without having to clean up spilled formula from the counter or putting away the tools needed to heat your bottle. Perfect Temperature: Baby’s are generally quite particular with how they like their bottles. Their bottles need to be just warmer than body temperature at 98 degrees. Traditionally this can be done with a bottle warmer, your faucet or a bowl of water in the microwave. However, using this method is quite a pain since you are constantly having to check the bottle to see if it is at the right temperature against your wrist because you don’t want to accidentally burn your baby or have them refuse the bottle. The Baby Brezza Formula Pro One Step Food Maker really does all the hard work for you. It keeps the water constantly at 98 degrees so that you never have to worry about heating up water or burning your baby again. 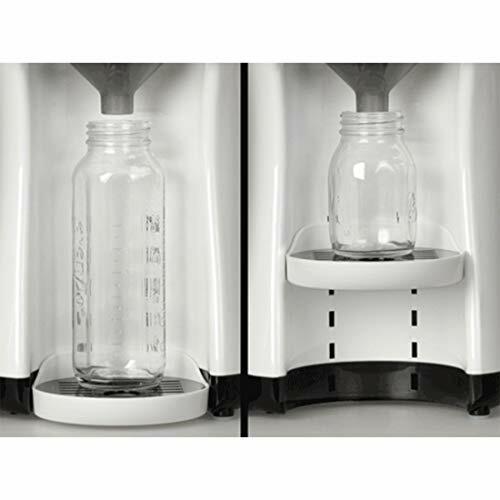 5 Different Amounts: This bottle making machine also allows you to choose how many ounces you would like in your bottle. It has 5 settings 2, 4, 6, 8, or 10 ounces. Though some parents complain because it doesn’t do odd amounts it is still useful to have options because you are less likely to waste formula. Though there have been complaints that it doesn’t always put out the correct number of ounces in the bottle. Adjustable: This baby bottle making machine has an adjustable floor so that you can use literally any sized bottle. By changing the elevation you can use small portable bottles, larger bottles or any off-brand bottle you find. It also doesn’t matter what size lip the bottle has. Separate Airtight Containers: The water and the formula are kept completely separate in airtight containers so that it is always ready and waiting to be used. You never have to worry about the formula spoiling or having to measure in formula. You just dump all your formula into the container and you’re good to go. Then all you are required to do is fill up the water and formula sections as needed. Settings For Formulas: Every formula is different so it’s important that the machine knows what type of formula you are using so it can be more accurate in measuring it out. It’s critically imperative that the machine knows exactly what type of formula you are using and that the machine supports this type of formula because otherwise you may end up with a clumpy or watery bottle. Both of which are not good as I’ll get into more below. 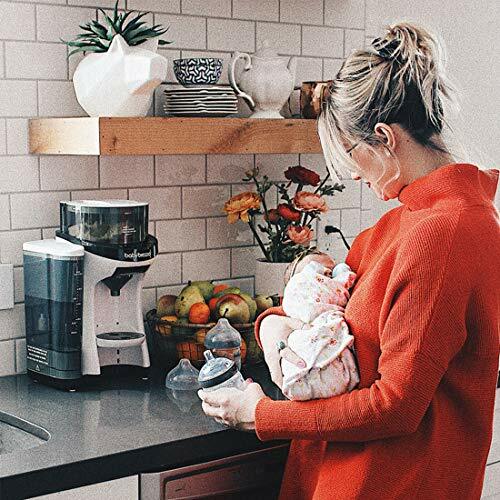 Generally speaking, the Baby Brezza Formula Pro supports most formulas and has a guide in the instructions for how to determine which level the machine should be set at to make the perfect bottle for your baby. Because it’s adjustable you have a wider range of formulas that will work with this product. 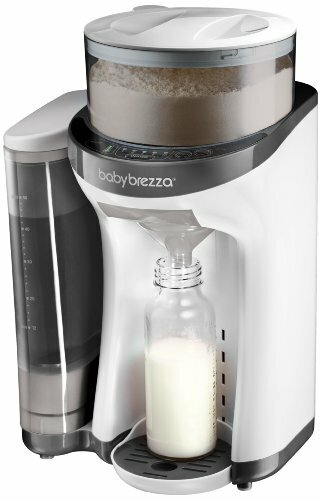 Lightweight: Without water or formula the Baby Brezza Formula Pro One Step Food Maker weighs only 4 pounds. This makes it very portable. You can take it to grandma’s house for a day or leave it permanently on your counter. It being light also comes in handy when you need to wash it. No Air Bubbles: Another common issue parents run across in making bottles traditionally is that a lot of air gets trapped in the formula when you make and shake the bottle. This machine greatly reduces the amount of air that gets trapped in the bottle with their patent pending bottle making technology. This could help reduce gas in your baby which can cause them discomfort. Always Ready: The best thing about this machine is that once the settings have been set and the machine’s been filled you can leave it plugged in and ready to make a bottle with no notice. It keeps the temperature at 98 degrees at all time so it takes less than 30 seconds to make the bottle. The Baby Brezza Baby Food Maker made our list of Best Baby Food Makers, so check that out, too! Formula Settings: As I mentioned above the Baby Brezza Formula Pro has various settings that are correlated to specific types of formula. There’s a chart online and in the manual that will guide you in selecting the correct settings. 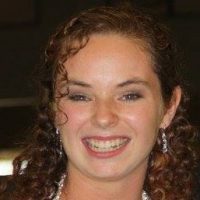 However it is very important you pick the exact correct formula as even formulas from the same company, but a different mix, can require completely different settings. This also means that the formula maker may not support the brand of formula you use or any subsequent formulas you try out on your baby. The other potential issue is that sometimes even when the settings seem correct it doesn’t always release the correct amount of formula. This could potentially lead to watery bottles. Experts warn that when you have too much water and not enough formula in a bottle it can lead to a condition called water intoxication. Doctors have discovered that when you give a baby too much water their sodium levels can drop causing seizures, comas or death. Once this machine is set to a particular setting it is supposed to always put in the same amount of formula, but if not enough formula is going into the bottle it could have serious consequences. This is not a risk I would take with my son. For the sake of convenience however, one could argue that when you are making a bottle in the middle of the night by hand, you are just as likely to make a measuring mistake. So in the end, it could be safer to use the machine so long as you make sure to double check your settings before you use the food maker. You can also remove the water and just run formula only to catch it and compare it to how many scoops you are supposed to use to make the bottle. If the amounts are the same consistency you should be good to go. Please note, one reader commented below that her machine wouldn’t let her do this so maybe it doesn’t work for all models. Must Clean Mixing Area Regularly: In the manual, it states you need to clean out the mixing area frequently to avoid formula caking and clumping when it mixes with the water. It takes less than 5 minutes but it needs to be done every few bottles or daily to ensure that mold doesn’t grow and that your bottles get enough formula. Though this may not be a deal breaker if you have to refill the water, refill the formula, triple check settings, save any extra formula that your baby didn’t eat because it only has even ounce amounts, and clean it every day or twice a day is it really more convenient than just making the bottle the traditional way? Doesn’t Filter Water: Another point that parents need to be aware of is that this formula maker does not filter the water before mixing it with formula. So either you should filter the water before putting it into this machine or use distilled water. Difficult to Fill Water: Once the container that holds the water the Baby Brezza Formula Pro needs to run has been filled up it is sometimes tricky to put it back in place. This isn’t a huge issue though since you can pretty easily add water to the machine with a cup or pitcher. Can Grow Mold: There are a few areas in this product that can’t easily be cleaned. As always whenever there’s an area that can’t be easily reached there’s a possibility that it could grow mold. Also if you aren’t in the habit of regularly cleaning this baby formula mixer it could cause clumps of formula to get stuck and mold could grow on that as well. These issues can be mostly avoided with proper cleaning and care. Overall the Baby Brezza Formula Pro is a very convenient device that is always ready and willing to make a baby bottle so you don’t have to. It prepares it at the correct temperature and is ready almost immediately. However, it is incredibly important to read the directions and make sure the device is adding enough formula. It’s also critical that you regularly clean it. I personally would rather make my own bottles so that I can have the peace of mind knowing I have added the correct number of scoops. However, if you have taken the necessary steps, this device could save you a ton of time and energy. Luvs vs Pampers: Which diaper is a better deal? Ingenuity ConvertMe Ridgedale Swing-2-Seat Review: Convertible or Confusing? Hi, I would like to quickly correct a minor error you’ve made. You cannot remove the water and run for formula only, the machine just beeps and blinks, nothing happens. Thank you, we made a note in the article.